Bonjour, and welcome to Le Petit Croissant! My name is Leah, and I have a passion for French baking. I have been baking since I was a young girl. While other teenagers experimented with new outfits and makeup, I experimented with pâte à choux, apple strudel, and chocolate soufflé. After frequent travel in France as an adult, I was inspired to replicate the golden brown and shatteringly flaky croissants I had enjoyed in France. A move to Colorado presented me with a whole new challenge: baking at high altitude (6,300 feet). When I could once again enjoy a little taste of France at home, I began selling my hand-rolled Butter, Chocolate, and Almond croissants at a local farmer’s market — and Le Petit Croissant was born. At my site de rencontre ivoirien locanto rencontres 24 rencontre 44 gratuite http://parkbarnyc.com/?flomasr=rencontre-loiret-femme&a0b=da site rencontre simple gratuit http://www.mylifept.com/?refriwerator=bin%C3%A4re-optionen-empfehlung&f60=27 canadian dating site free rencontre ephemere tunisie look at more info moved here FARMER’S MARKET BOOTH, I now sell 8 flavors of hand-rolled croissants, 21 flavors of truly delicious handmade jam, granola, scones, bread, and more. Please click here for a schedule of my market dates, times, and locations. 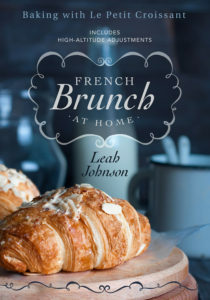 The award-winning COOKBOOK I published in late 2016 — French Brunch At Home — features my best recipes, and includes adjustments for high altitude baking. I’ll have you whipping up family treats in no time. Baker’s Tips, lovely photography, and fascinating histories abound. This book is the perfect gift for friends, family, work colleagues, and — of course — you! In response to customer requests, I developed a “LEARN TO MAKE CROISSANTS” CLASS in 2017. It was a hit, and has now become my signature class! I can now teach you how to whip up French classics in the following CLASSES: CLASSIC CROISSANTS – CHOCOLATE CROISSANTS – MORNING BUNS – MACARONS – FARMHOUSE BREAD & BUTTER – PERFECT QUICHE – and more that are still in development. There is plenty of personal instruction, and I rarely separate students into groups to make different things since I want everyone to learn the feature dish in its entirety, from beginning to end. Look for my class schedule on the Calendar page of this web site. The Macarons class in particular is a fun experience for any group you want to pull together of family, friends, neighbors, office colleagues, bridesmaids, meet-up friends, or others. Simply contact me at leah@lepetitcroissant to arrange a PRIVATE EVENT. I need a minimum of 5 pre-paid students, but if you pull together 6, you’ll each save $5 on the class you choose! Want to sign up for my NEWSLETTER? I feature seasonal recipes, baking tips (high altitude and other), the courses I’m teaching / developing, French community news, and more. Just fill in the box on this page with your email address. I hope you will also join my FACEBOOK GROUP, “Baking 911: Tips, Fails, High Altitude Tricks”so you can ask and answer questions, share your kitchen “fails” in a safe place, and gain insight into the vagaries of high altitude baking. Or maybe you’d like to share your fails just for laughs? After all, what’s brunch without a few guests, some shared laughs, and interesting conversation? Last but not least, I have begun writing articles for the occasional local magazine. Join my Le Petit Croissant FACEBOOK PAGE to see the links and keep up with other news and photos! Questions? You can REACH ME DIRECTLY at leah@lepetitcroissant.com, or by filling in the appropriate form on this site. Thank you for stopping by. I hope to see you in a class, or at my booth, sometime soon. Bon Appétit!